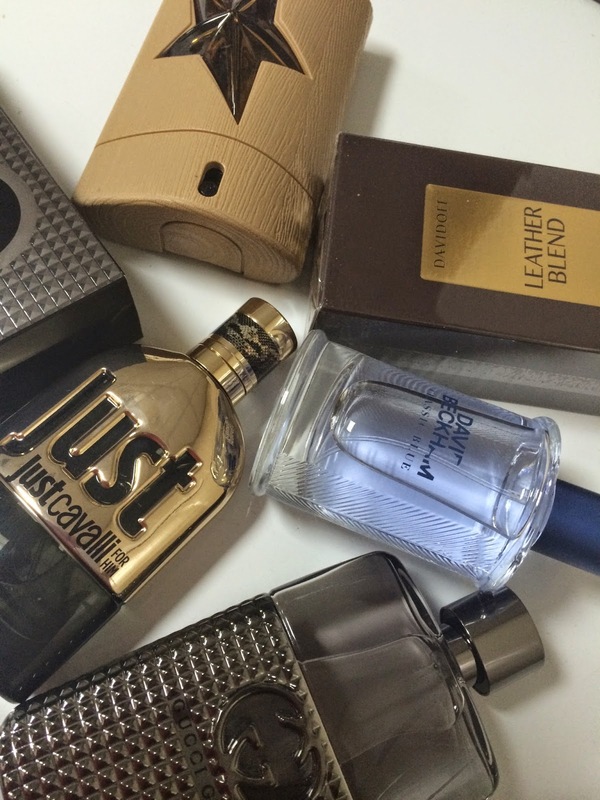 Opinionated Girl : Fall Perfumes for HIM! First off we have Roberto Cavalli - Just Gold which is extremely strong! Definitely a Night perfume more than a Day one! This perfume opens with a blend of black pepper, cardamom and nutmeg with medium notes of ristretto coffee. The Base comprises of vetiver and leather contributing which is the reason behind its' elegance and masculinity. The sillage (the extent of others smelling it) is heavy and it's long-lasting. Also, the bottle is just GORGEOUS! People, this perfume has "clean shave" written all over it! Pretty sure a lot of ladies out there know what I mean! ;) This perfume definitely falls under the fresh category top notes of pineapple, grapefruit and violet leaf. The medium notes consist of geranium, clary sage and apple. Whereas the base notes include woody cashmere, patchouli and moss. 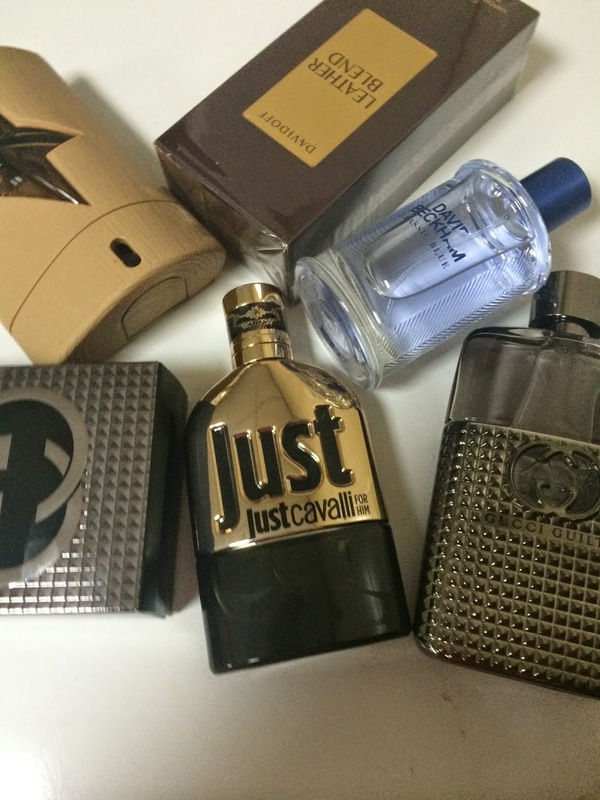 These are one of the perfumes that would definitely catch people's attention! An innovative release by Davidoff "Leather Blend" is the first in a line of fragrances based on special notes and celebrates precious leather. The Top notes include spicy flavors of saffron and black pepper. Whereas the medium notes include warm scents of rose with shades of hot amber, and the base consists of precious leather leaving an irresistible scent. This is THE perfume for the typical middle-eastren man! Wonderful packaging! That's the first that comes to mind when I think of Thierry Mugler - A * Men Pure Wood. This is their newest launch, and it's a great one at that! It has a distinctive scent because it opens with notes of coffee then moves to oak notes, vanilla, patchouli and cypress. Again, I love the fact the bottle is designed in "tree"-y texture. This comes in 100 ml EDT. A classic? I believe so! The Gucci Guilty Pour Homme is theperfect perfume for the charismatic and smooth (not criminal I hope!) talker in your circle. It has amazing Lavender, Lemon, and Orange blossom top notes as well as warm woody cedar and patchouli base notes. The bottle is extremely sleek and simple, again, perfect for the charming ones! So there you have it! That’s my list for Fall for men! Which perfume are you (or your significant other) rocking during the sweater-weather?